See lot 680 for a discussion on the Guyue Xuan (Ancient Moon Pavilion). 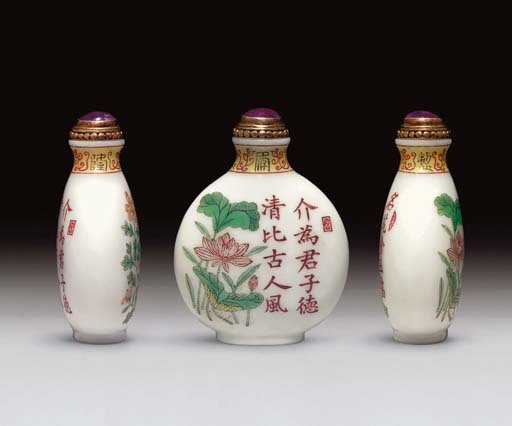 Early Guyue xuan bottles are characterized stylistically by simple, flora (usually lotus) designs with pink blooms outlined in iron-red and green leaves delineated in black enamel, with, sometimes, a butterfly. They are often accompanied by iron-red inscriptions, usually in regular script. Various poems appear, and some are repeated frequently, mostly on the subject of lotus, including one famous ode to the flower by the Tang poet, Li Bai. Several from the very early years following the completion of the Guyue Xuan have two marks - a four-character Qianlong mark, either around the neck or as part of the decoration on one main side, and a Guyue Xuan mark on the base, as is the case with this lot. An example from the Bloch Collection has a four-character Qianlong reign mark in blue roundels around the neck and the standard Guyue Xuan mark on the foot. So we suspect it is an illusion gone back to the moon." For a further discussion of this important early group of Palace enameled Guyue Xuan wares produced at Court, see H. Moss, "Mysteries of the Ancient Moon", JICSBS, Spring 2006.